Even though few of us possess a high-quality camera, almost anybody has nowadays a smartphone with a decent camera. In case you are thinking about getting to the next level with your phone photography, buying some powerful new lenses could be an amazing upgrade for a stock phone camera. There are lots of kits on the market right now which contain various types of lenses, one of the most common being the fisheye lenses for capturing a 180-degree field of view and the wide-angle lenses to immortalize expansive landscapes or scenes. For getting more close-up details, many manufacturers also include macro lenses. Some can even add telephoto and CPL lenses. You might be interested in our articles about the best smartphone microphones and the best portable projector. How to find the perfect smartphone camera lenses for your needs? If you intend to add some extra optics on top of your smartphone’s existing camera, you’ve got quite a wide selection of lens attachments to choose from. To make your job easier, we compiled a list of the best phone camera lenses that money can buy. A quality lens should always enhance rather than deteriorate the image and there are a few more aspects to consider before you jump in and purchase a brand new kit of phone camera lenses for your smartphone. This is important, lenses that are difficult to use quickly are simply not worth it. There are some models which offer special rubbery designs to keep the lens from slipping and an easy to use clip which glides onto your smartphone. There are some great lenses on the market that offer premium optical glass and other solid quality materials which add to the overall durability. Some kits contain sturdy storage cases for transporting your lenses, to safely hold all the components together. Even a die-hard enthusiast of phone camera photography probably won’t be willing to spend more than $100 on lenses for their smartphone. You can find some good image quality in more affordable options. Keeping the balance between features and cost is important after all. The picture quality is obviously the most important factor to consider but it all depends on which type of lenses you prefer to use more in your photography sessions. In this list, you can find some solid choices for phone camera lenses that have the potential to truly expand your possibilities without spending too much money. Let’s see which are the best phone camera lenses currently to be found on the market. This kit from Amir is an ideal choice considering the high level of quality for such a reasonable price. It provides any smartphone owner with high clarity lenses that are very portable and very capable of enhancing your photos. This set contains three types of lenses, wide angle, fisheye, and macro. As the company offers high compatibility with their lenses, the kit has great potential. With the help of six levels of professional accuracy SLR glass, you will be able to avoid almost completely any glare and invalid reflections. The first lens that attracts attention is the 0.40X super wide angle one. This allows you to include more of the scene in the picture to capture superb wider photographs. The 180° fisheye lens from this kit enables you to see the world from a different angle and to shoot a new experience. That round fishbowl effect will make your photos more stylish while they’ll also act as wide angle lens. Finally, through a macro lens, you can see the hidden perspective of closer objects by taking a deep and detailed look. With these 10X lens you are able to take decently sharp pictures as close as 13 mm from the subject. It should work great for flowers, insects, or coins among others. Something worth keeping in mind about these glass objects is that they aren’t suitable for Zhiyun Smooth Q gimbal. It’s also highly recommended to take any case off your phone to get better photos and to usually avoid the flashlight as it might be blocked for certain smartphone models when using the lens. Amir offers a nice portable design with a detachable universal lens clip that works with a large variety of smartphones including iPhones and Android devices. They are even suitable for iPads. For this lenses, there is a nice looking microfiber cloth for cleaning and a black case which is useful for protecting the lenses during transport. All in all, this is a very affordable option for obtaining awesome looking effects for your pictures. All the lenses, especially the wide angle ones, can add a lot more fun to your everyday photo shoots. At this price, you shouldn’t really expect premium quality, but the lenses can do a good job at enhancing your phone’s built-in camera. Made of premium optical glass, the Xenvo Pro Kit for iPhones is guaranteed to add a new level of excitement to your photos. This kit offers a potent combination of lenses. You’ve got a wide angle lens for capturing more objects in your photos and a macro lens that delivers a stunning 12.5X level of magnification to achieve some really amazing close-up shots. The wide-angle lens is crafted from aircraft-grade aluminum for increased durability and Xenvo only uses high-quality glass for achieving ideal levels of clarity. To minimize ghosting, reflections, and other artifacts, the manufacturer coated the lenses with a special multi-element layer. Due to an impressively wide angle (0.45X), you can capture more elements in your photos and as opposed to cheaper lenses, you won’t have to deal with vignetting, those dark corners that may appear on lower quality products. If you wish to be able to capture those particular details and jump into the unexplored world of small objects, the macro lens from this kit should be a huge help. They offer 12.5X magnification to capture all those intricacies with precision-focus for crisp macro photos. The clip used to fasten the lenses to your smartphone comes with some strong gripping power but it has soft rubber pads to protect your device from scratches. A rechargeable led light plugs into your phone and is used for brightening the surroundings with a pleasant continuous light which is superior to the built-in flash from your device. The flash often does more harm than good as it blinds people and yields unnatural photos in very dark settings but this LED light should reduce the number of photo retakes and make it so you get the right photos every time. For safely transporting the lenses, Xenvo offers a very sturdy storage case that holds all the components together. There’s also a special clip provided for hooking the case to a laptop bag or backpack for quick access to your lenses. Quite a convenient solution. 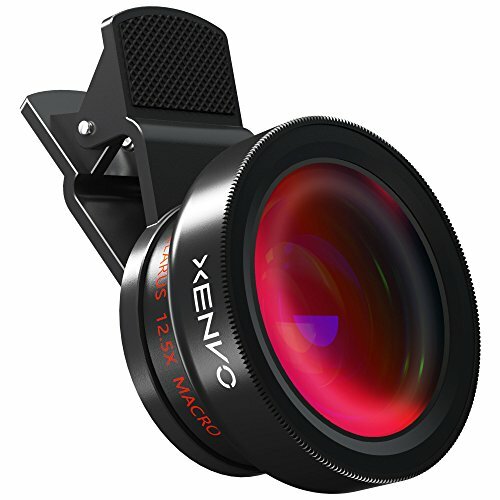 Although Xenvo’s lenses kit is geared towards iPhone users, these should basically work with any smartphone that can fit them. All things considered, they did an excellent job with this little set of quality lenses. You can see the difference clearly but the price is also a bit higher than other kits. Still, if you want to be able to take more professional photos with your iPhone, don’t hesitate to purchase these lenses because they are absolutely worth the money. If you are on a budget but you still wish to achieve some interesting effects for better-looking shoots, than the Pocket Lens kit is a highly viable solution to your needs. Marketed as a cheaper alternative for more expensive brand-lenses, the lenses from this kit won’t blow you away but can do more than you’d expect at this price point so they should be taken into consideration. The kit is basically a combination of a wide angle lens and a macro lens. These two can each, in their own way, expand your creative potential allowing you to capture some great photos. The 0.67X magnification of the wide angle lens means you get a good 25% extra in your image. A decent value for capturing more of the scenery. It could have been better but it should be enough for most situations like when you need to fit someone in a group shot for example. The Macro lens is made of aluminum and glass and provides a good magnification level (10X) sufficient for some nice close-up pictures. There is a white durable clip designed to stay fixed in place that should be compatible with many smartphone models though it’s designed to work best with iPhones. It can get over most phone cases but it’s recommended to take off the case for getting the best results when taking pictures with the lenses. Another useful item is a waterproof pouch made with double lining. It provides a minimal level of protection for the lenses but it’s better than nothing so no complaints here. Both lenses from this kit have the ability to dramatically shift your perspective and suddenly many things become more interesting to capture in your photos. Pocket Lenses did a solid job in creating an affordable pack of lenses that should bring back the pleasure of photographing thanks to the sweet effects achievable through these optical items. For a novice photographer or a casual hobbyist, this kit strikes the perfect balance between lens quality and price. Due to the fact that normal smartphone cameras are still quite limited despite so many technological advances, getting a kit of quality lenses seems like a no-brainer for those wishing to expand their creative potential. DOFLY offers a nice little kit with such lenses that will allow you to take some spectacular shots. Priced very fairly, this universal kit can add a professional feel to your photos that’s sure to impress your friends. Three essential optical elements are offered in the kit. First of all, you’ve got the 230-degree fisheye lens. It can produce a visual distortion with the intention of creating a hemispherical image. With this lens attached, you can discover an interesting world and take some funny pictures in a stunning viewing field. The second lens that DOFLY added in this package is the 0.6X wide angle one. Ideal for group shots, this lens takes a very wide range of coverage providing a 150-degree viewing angle to enable you to photograph truly stunning pictures. The last optical item that can be found in this kit is the 15X macro lens, which is used for highlighting those intricate details and textures of a tiny subject and environment. Besides the solid quality of the lenses, the company focused on reliability as they made the optical elements from high-class glass and designed them professionally to avoid as much as possible the glass flare and ghosting that can happen because of reflections. The aluminum metal casings of the lenses are very stylish and give off a premium feel. In terms of compatibility, the company promises that their lenses can be used on many iPhone models and Samsung devices and others that can fit them. Something worth mentioning is that the manufacturer offers a well-built protective case for the lenses as they are quite delicate and should be handled with extra care during transport. If you are set on purchasing a highly capable set of lenses for your phone’s camera, this universal lens kit is one of the best recommendations from this list. The lenses make a great impression when taking pictures, their effects clearly enhancing your shoots. Considering the price tag and image quality of this kit, you won’t get disappointed. 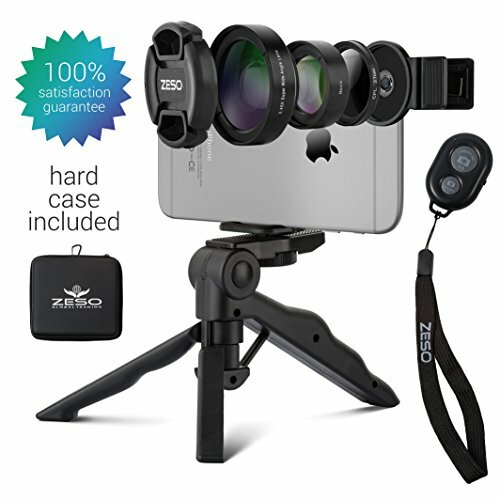 Specially designed and engineered to take your photos to a more professional level, this camera lens kit from Zeso comes complete with a tripod and a selfie remote control to get more enjoyment out of your phone’s built-in camera. The price is a bit higher than some other more basic kits, but considering what you get in return, it’s safe to say that it’s fully worth it. 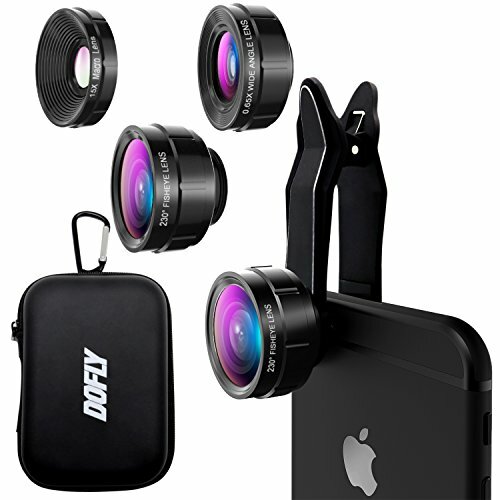 Zeso offers a 3 in 1 kit with wide angle lens, macro lens, and a CPL polarizer filter. Let’s see what can each of these do for your images. The 0.45X wide angle lens can help you capture a much bigger field of view which can significantly increase the quality of your selfies among many other types of shoots. The 15X macro lens allows you to shoot close-up photos and explore some hidden depths. The massive level of magnification can make a real difference when you’re trying to capture all those particular details and textures of small objects. Lastly, there is a 37mm CPL polarizer filter which creates a light scattering effect for obtaining the clearest pictures possible. There are some interesting goodies in this pack. One of them is the multi-functional tripod that’s useful for a more stable way to take pictures and shoot videos. It’s sufficiently compact and lightweight and has a universal cell phone mount adapter. Thanks to the Wireless Remote Control, your selfies will be great every time. It also helps with taking steady tripod shots and it’s incredibly easy to set up. Another nice addition is the plastic clip for managing a quick connection without damaging your phone. The rimmed glass can significantly reduce light reflection around the edge of the lens. 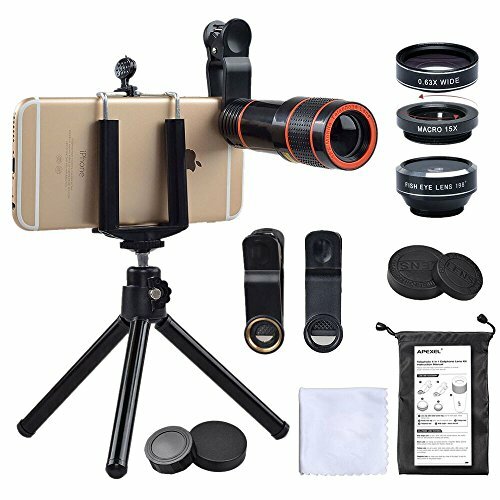 This Zeso kit boasts an impressive collection of items intended for the hobbyist who wants to expand the potential of photos taken with a smartphone. Considering the excellent quality of the lenses and the generous amount of handy accessories, this is one of the best products for obtaining amazing photo results. With four great lenses in one single package, this Zwish kit is focusing on improving the quality of mobile photography with some neat effects. There is quite a wide range of compatible devices as the clip-on design ensures a simple attachment with almost all smartphones. At this price point, this lens kit is definitely a bargain. Here’s why this is such an attractive choice. The main highlight from the pack is the 12X optical zoom telephoto lens that’s able to turn distant targets into a true form. Similarly to a monocular telescope, it can be removed and used as a standalone telescopic lens to watch football games or distant wildlife and scenery. Shooting far away objects clearly is much easier thanks to this powerful telephoto lens. The 0.63X wide angle lens work the best for shooting a larger portion of scenery like long cityscapes. It works nicely for group shots too. In order to get better results, you need to be in a reasonably wide area to effectively use the wide angle lens. A fisheye lens is another addition which will give a cool round effect to your images, similar to a fishbowl. The possibilities for capturing some really amazing shots with this lens are endless. Zwish also provides a macro lens with a 15X magnifying power to take detailed photos of small objects. Regarding the wide angle and the macro lenses, these are delivered in a 2 in 1 set. They are screwed together for a more simpler way to store them. For using the macro lens, you only need to unscrew the wide angle ones. The construction of the lenses is not that sturdy as they are made of plastic and aluminum alloy. This is not an issue given the price, if you prefer lenses made with metal that have some weighty feel, then you should probably look for a more expensive kit. Looking back over the quality items from this kit by Zwish, the final conclusion leans on a positive note. All the lenses in this package are working in a very reliable manner and provide a surprising level of quality to your photos, especially the telephoto lens which is probably the most interesting from the kit. The price is more than reasonable for what you get so this kit obtains a full recommendation for those who want more out of their built-in camera. 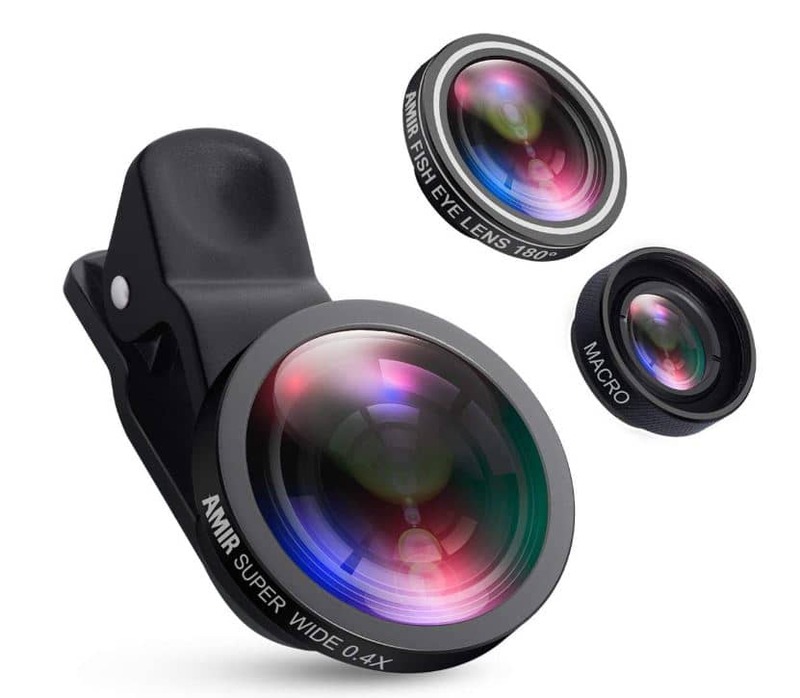 Another great set of lenses, this time a 5 in 1 kit, comes from ClipityPix and is geared towards casual hobbyists wishing to add a little spice to their smartphone photos. The price is quite affordable for such a considerably large set and the quality seems pretty much on par with what you pay for. Packed in a neat little case, you have many types of lenses suitable for a multitude of situations. Besides the usual wide angle, fisheye, and macro lens, you can discover two telephoto lenses and a CPL lens. The telephoto lens is useful for taking distance shots and the CPL one has a special polarizing filter which eliminates some of that reflection and gives you a clearer picture. The 198-degree fisheye lens is perfect for obtaining those funny circular photos and the 0.63X wide lens can extend your perspective a bit, to capture more objects from a wide area. Finally, the macro lens with 15X magnifying power should enhance the details of small objects that you want to take pictures of. ClipityPix ensures a high level of compatibility with these lenses though it’s worth noting that this set is not suited for dual camera lens phones. Another thing to keep in mind is that the macro and the wide angle lenses are attached and have to be separated when you want to use the macro lens. There’s not much else to add about this fancy kit except that it costs very little for what an impressive array of lenses it provides. Excellent for events and group shots, these phone camera lenses are one of the best at creating quality photos that last a long time. 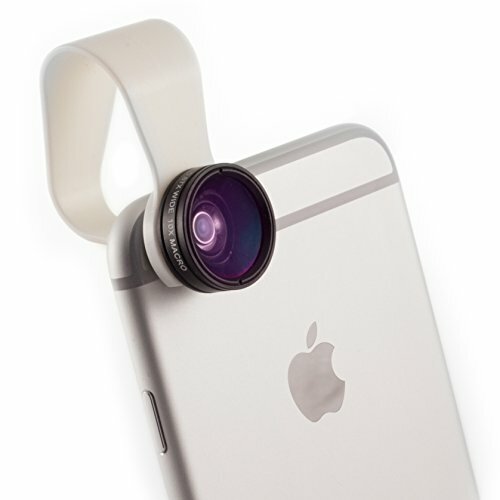 For all those who don’t think that you should sacrifice a huge budget for such a simple accessory, this 3 in 1 phone camera lens kit from YIEASY is an excellent option. 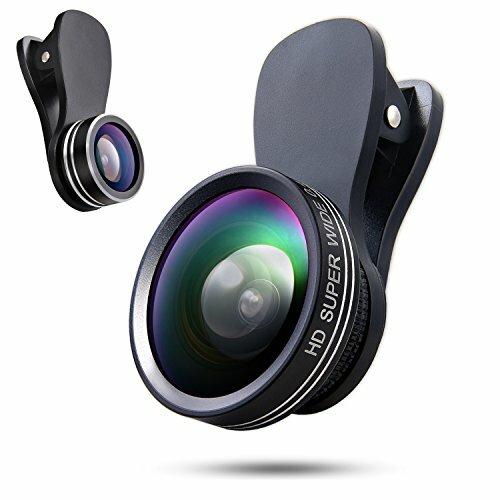 With such a low cost and being so simple to use, these lenses will redefine the way you take pictures with your smartphone making it a much more enjoyable experience. The primary attraction when it comes to the lenses from this pack is definitely the 0.4X wide angle one. It can bring a new perspective into your photos allowing you to capture a very large view of the scenery. It’s rare to see such a capable lens at this price point. Another lens in the kit is the 180-degree fisheye lens useful for taking cool round images perfect for certain situations. The macro lens is the last one found in this kit and has a decent amount of magnifying power (10X). In terms of durability, the construction of the lenses is pretty good, with aluminum materials for the frame and ABS for the clip that keeps the optical elements fixated on your device. They designed the clip with a silicon pad to make sure that your smartphone doesn’t get scratched and can slide easily. The clip has a low profile and should be compatible with most iPhone and Android devices. To increase the viewing angle, the wide angle and the macro lenses are connected together but you can easily separate them. 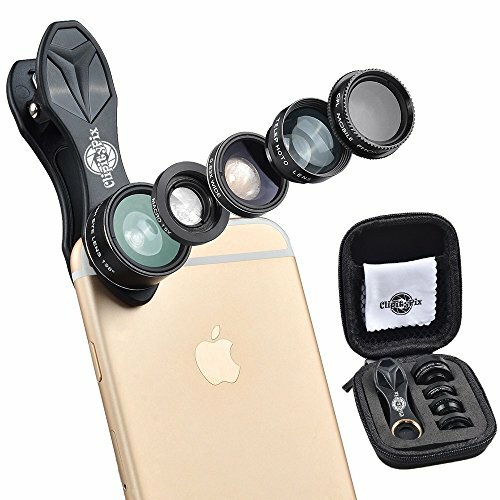 If you a have a passion for taking photos with your smartphone and need some easy-to-use multifunctional lenses, this pack will fit you like a glove. If you line them up correctly, you can create some beautiful pictures with amazing clarity. Just for the wide angle lens, this kit is absolutely worth the money.